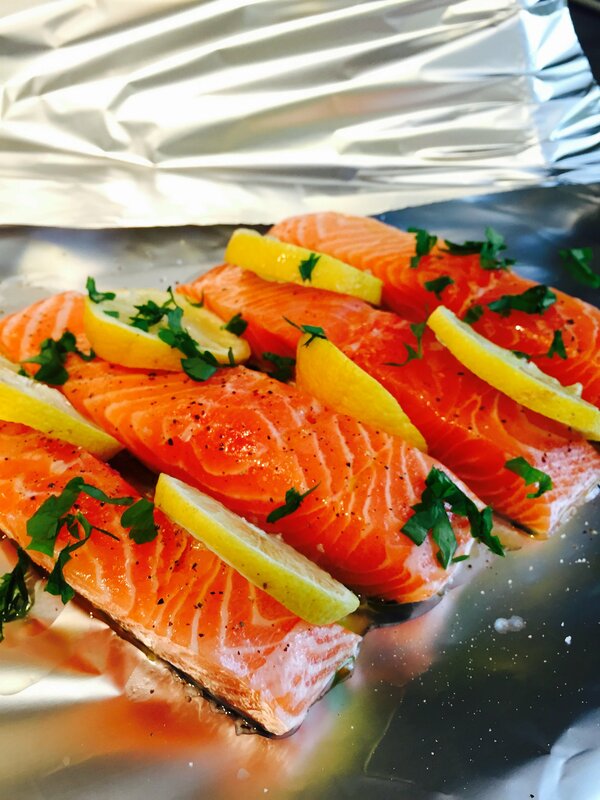 Simple salmon baked in foil is so easy and best of all no pan to wash. The salmon in foil parcel can be made up in the morning and left in the fridge all day so it’s just a matter of popping it in the oven at dinner time. It’s quick to put together, quick to cook and there’s so many different flavour combinations you can take it in. To make up the parcel just lay a piece of tin foil onto the kitchen counter, lightly grease with just a drizzle of olive oil rubbed across the foil with your fingers. Lay on the salmon fillets and pack around your chosen flavours. We usually opt for simple sliced lemons and a handful of coriander. Place another piece of tin foil on top of the salmon fillets and seal the edges by folding them together and scrunching tightly shut. You can then leave this in the fridge until ready to cook. To cook, heat the oven to 180C and put the foil parcel onto a baking tray and into the oven for around 20 – 25 minutes. Then open carefully as the steam will rush out. Serve on top of buttery peas with a freshly made salad, maybe some steamed basmati rice or chips alongside. Place a sheet of tin foil on to the kitchen counter - lightly grease with olive oil. Place the salmon fillets onto the foil, lay on the sliced lemons, scatter over the coriander and season with salt and pepper. Place another sheet of tin foil over the top and seal all the edges tightly. 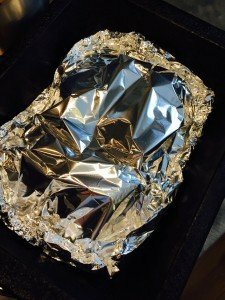 Put the tin foil parcel onto a baking tray and cook in the oven for around 20-25 minutes. Open the parcel carefully as steam will rush out. 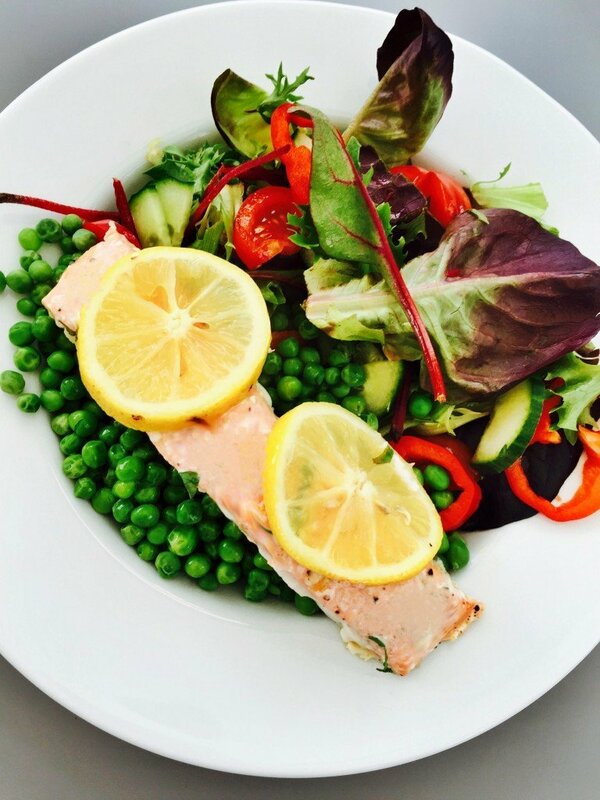 Serve the salmon on a bed of peas with a large salad and maybe some rice or chips. Flavour the salmon differently, we like Thai style salmon, just top the fillet with a tsp of green thai curry paste and rub in to coat well. Go Italian and coat the salmon with a tsp of basil pesto and scatter with torn basil leaves. Make it a complete meal and tuck in some small bitesized potato cubes or slices and a handful or two of greens, tomatoes and garlic cloves.